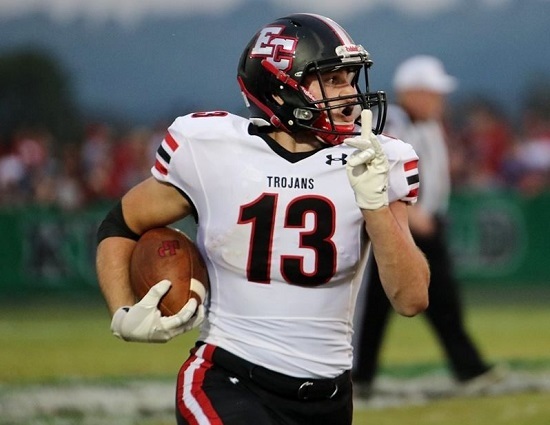 HARRISON, ohio – One week after being shocked by Oak Hills, East Central found its way back in the win column. The Trojans looked sharp versus interstate rival Harrison in the annual “War on 74” donnybrook. They had their way with the Wildcats up front, churning out 504 yards of total offense (386 rush, 118 pass). Their first six touchdown drives were all less than four minutes long. East Central senior Eric Rosemeyer led the way with 215 yards rushing on 21 carries. He had four of the Trojans seven rushing touchdowns. Teammate Jake Fike pitched in with 98 yards on 12 totes while finding paydirt twice. On defense the story was the same in the trenches as the Trojans held Harrison to -19 yards on 22 attempts rushing. Bret Fox (three) and Kyle Krummen (two) brought the heat combining for five sacks of Wildcats quarterback Connor Kinnett. Despite the constant pressure Kinnett still managed to throw for 239 yards but went just 16-37 with a pick. His top target was Levi Tidwell who had eight receptions for 155 yards. That makes back-to-back games of more than 100 yards receiving for Tidwell.